CALGARY - Calgary's mayor is again demanding answers from Canadian Pacific Railway after eight rail cars full of oil chemicals derailed at a train yard in the city, forcing the closure of major road and the evacuation of some homes. Six of the cars, which were carrying a diluting agent used in oil pipelines, flipped over during rush hour Wednesday. Residents in some homes in the immediate area were told to leave, but no one was hurt and none of the cars leaked. The derailment comes less than three months after a bridge over the swollen Bow River gave way underneath a CP train (TSX:CP) while the city was trying to recover from severe flooding. Mayor Naheed Nenshi said "two derailments is two too many." Nenshi was one of the Calgarians trapped in traffic during Wednesday's derailment. "That is not only massively inconvenient for people, it's also massively dangerous as we have thousands and thousands of people going through this area," Nenshi said Thursday. "Once again it was city staff, who have no regulatory authority on this, risking their lives to solve the problem and we can't solve the problem if we're not given correct, accurate information at the beginning. "It again highlights what municipal politicians have been saying for a very long time, which is we need better regulations on the movement of trains through cities and particularly the time of those movements." 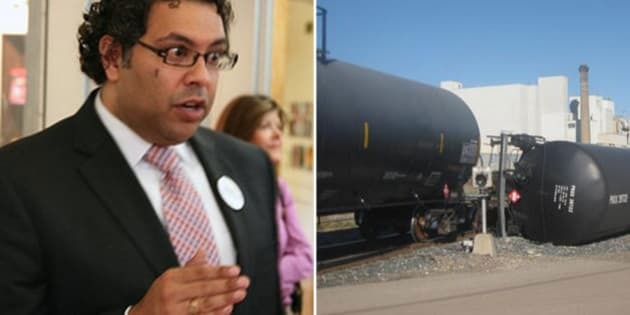 Nenshi was furious when the derailment happened during the flood recovery, questioning whether the company had laid off any of its bridge inspectors. The tank cars involved then were also carrying a petroleum dilutant. They were unloaded and removed without going into the river. Engineers blamed the failure of the bridge on fast water scouring away gravel under a support. CP CEO Hunter Harrison said at the time that the company would have normally sent divers down to inspect the bridge, but the water was moving too fast and it would have been "jeopardizing commerce" to hold back trains. Nenshi said the cause of the latest derailment still isn't clear. "I'd really like to know what actually happened. How in the world did these rail cars tip over?" he asked. "Again we had an enormous amount of trouble getting a straight answer from CP about what was in those cars. As a matter of fact one of my colleagues got a phone call from CP where they said, 'you throw a match in there it won't catch fire.' Well, given that it was natural gasoline, that's not quite true." Nenshi had a long conversation with Harrison after the June derailment in which he received an apology. He intends to renew their relationship in the near future. "We had a very good conversation around the derailment in which I was assured safety was the primary concern of Canadian Pacific, that they hadn't laid off any people who were focused on safety or inspection of track," Nenshi said. "I want to have a good conversation about understanding what's being shipped, how it's being shipped, how we communicate and what CP is willing to do to make sure danger to others is minimized." CP spokesman Ed Greenberg said a meeting with Nenshi is planned in the coming days. "We value our relationship with the City of Calgary and the mayor," Greenberg said. "We look forward to having a dialogue and an exchange of information with Mayor Nenshi."